Ask an animator or a clown to visit the party to entertain children for a while. 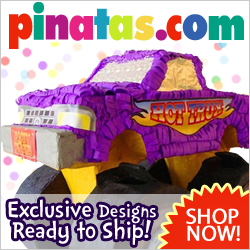 The pinata is also a useful party supply to make a party game and entertain children. Play some fun music for children to relax and dance. Sing-along songs are a great party idea for smaller kids. Let your child choose her/his party theme and start organizing this special event. Decorate with many balloons and posters on the colors and theme that your child has chosen for her/his party. If the party is for a girl we know that their favorite party themes are Enchanting Barbie, Bratz, Strawberry Shortcake and Hello Kitty. A princess party is always a success for a girl’s birthday. If you’re planning a boy birthday party remember what boys always like. Party themes like Sponge Bob, Spiderman, dinosours and sports are always their favorites.